Today was a day filled with interaction with students. The morning began with the arrival at Chuo Gakuin University, where we met up with a group of students from two universities. We had a day full of activities before us, so we soon began with the first one. Our first activity for the day was a lesson in using furoshiki. For those of you who have never heard of furoshiki before, it is a traditional Japanese wrapping cloth that is used to carry around all kinds of things. After we all sat down in groups containing Japanese students and World Campus Japan members, we began very simply by making a small traditional hat. We then wrapped and knotted several things with the cloths. The one I liked most was wrapping a bottle in such a way that it looked like it was wearing a kimono. It looked very pretty and it was fairly easy to do. Next time I give a bottle of wine as a present I will probably wrap it like this. Even though I liked the bottle kimono the most, it was also the most ‘useless’ thing that we made. All the other things we wrapped had some use other than just being pretty. For example, we wrapped a watermelon into the cloth in such a way that made it very easy to carry (as far as a watermelon can be ‘easy to carry’). We also made a bag, a backpack, and we learned how to wrap 2 bottles together to make them easy to carry. I was surprised by how many things you can do with just a square cloth. After the furoshiki workshop had finished, it was already time to have lunch. Together with the students, we put our own lunch together. The lunch consisted of a hotdog and a ham-and-cheese sandwich, which was a nice change from all the rice (although I have to admit that the average bento box tastes a lot better). After lunch we went to play a few games, beginning with our very ‘mature’ variant of Jankenpon (rock-paper-scissors) called Evolution. The students had chosen a mimicking game and a game of musical chairs. It was a lot of fun. 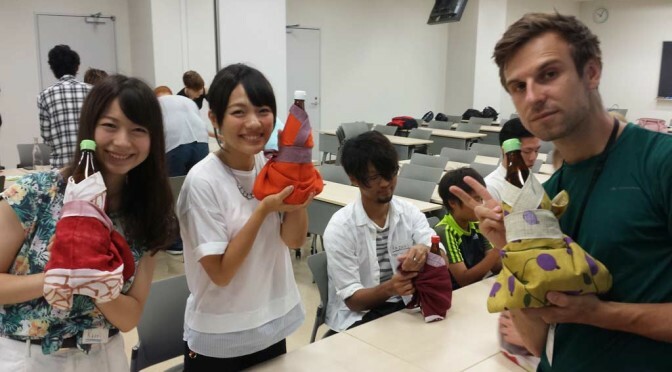 I think that playing games and having a workshop like the furoshiki one are very good ways to interact with the Japanese students since most of them speak very little English. And the games and workshop allowed us to interact and have fun together without having to talk a lot. After the games it was already five o’clock and time to go back to our host homes. My little host sister of 12 had promised to show me kendo, and today she brought her uniform with her. She was so kind to let me try it on. But as expected the uniform reached till just underneath my knees. Since the clothing is quite loose I could still easily put it on though, and while I was dressed in my small kendo uniform, my host sister taught me some kendo techniques. Sometimes it was hard to understand what she was trying to explain since her English is just as limited as my Japanese (which is almost non-existent). Even so, she tried really hard and it was a lot of fun to do. It was already the last day of our stay here in Abiko, so this night my host family was obliged to fulfill their promise to take me to a ‘rotation sushi’ restaurant. They could not explain it very well, but basically it was a restaurant where most of the serving was done by a conveyor belt. You can order sushi (and other kinds of food) using a touch screen, and then your order would be brought to your table by the conveyor belt. It was a lot of fun to see all the different kinds of sushi and other food (and apple juice) pass you by on the conveyor belt. I never knew that there were so many things you could make sushi out of! Sushi knows a lot more variety here in Japan than in the Netherlands. After our last dinner together we went back home. It was sad to think about our inevitable goodbye tomorrow morning.